The pheasant, like many Americans, is an immigrant to North America. The first successful introduction of pheasants to this country occurred in 1881 when Judge Owen Nickerson Denny (US consul to China) shipped 30 Chinese ring-necks (26 survived the journey) to his home in the Willamette Valley of Oregon. Eleven years later Oregon opened a 75-day season and hunters bagged 50,000 pheasants. They were subsequently released in 40 of the 50 states. The pheasant thrives in a farmland landscape with ample (20%+) undisturbed grassland habitat. Pheasant populations increased and reached all time highs in the mid-1900s before suffering severe population declines. In a land rich in symbolism and imagery, the Chinese pheasant represented light, virtue, prosperity and good fortune. Good fortune indeed came upon one hunter in Burma who noticed a precious stone in the gizzard of his recent kill. The discovery inspired him to search for the origin of this stone, and after visiting the rooster’s old stomping ground, sure enough, he found an emerald mine! 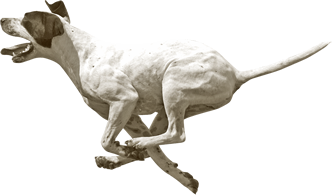 The pheasant was also associated with a 2000 B.C. emperor named Yu who was famed for developing a complex system of flood control. Similarly, references made to our endeared bird always place it next to important rivers (like its namesake, the Phasis). Perhaps a coincidence that the pheasant was associated with water, more likely it merely provided good habitat. Thousands of years later in Europe, the pheasant was prized for its exotic beauty and tasty meat. The right-to-hunt pheasants was reserved for the upper class. Numerous attempts to bring pheasants to the “land of the free” failed. 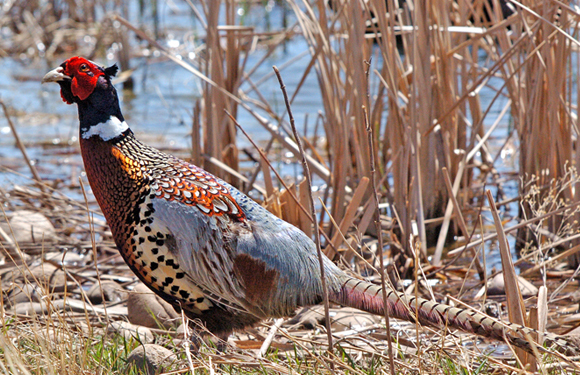 Ben Franklin’s son-in-law, Richard Bach, released some pheasants in New Jersey. George Washington had some sent to his Mount Vernon estate during his first year of presidency, and the Governors of New Hampshire and New York also attempted to introduce the “old English blackneck” pheasant. Most of these pheasants were raised on game farms and were not hardy enough to survive. Therefore, these introductions proved unsuccessful. Male ring-necks feature a white ring around their neck and body plumage of gold, brown, green, purple, and white. The roosters head has blues, greens, and a distinctive red wattle. Females are much less showy with drab brown feathers. Pheasants are birds that can be found alone or in small flocks. Typically, a mother hen and her flock will stay together until early autumn. While pheasants are able to fly fast for short distances, they prefer to run. If startled however, they will burst to the sky in a “flush.” Their flight speed is 27 to 38 mph when cruising but when chased they can fly up to 60 mph. Pheasants spend almost their entire life on the ground, rarely ever being seen in trees. They eat a wide variety of foods; including, insects, seeds and leaves. Roosters typically have a harem of several females during spring mating season. Hen pheasants nest on the ground, producing a clutch of around ten eggs over a two to three week period in April to June. The incubation period is about 23–26 days.